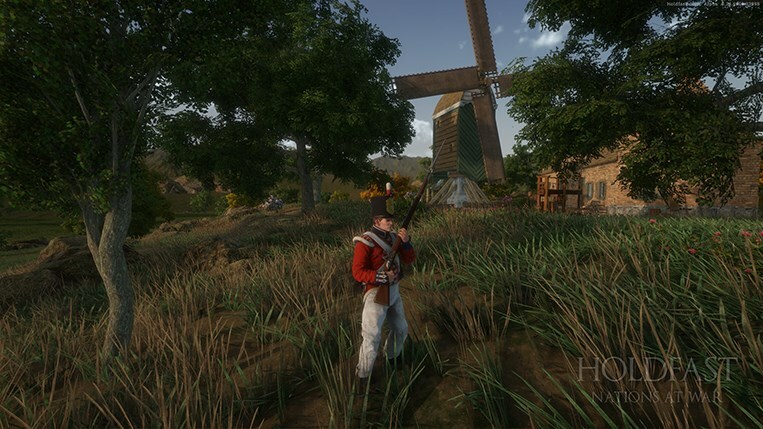 Following the game engine update, we’ve been focusing our development efforts on more optimisations. You’ll also find that the good majority of bugs present in the previous BETA no longer present as we polish things through in preparation for this update’s official release. Characters being one of the major bottlenecks in performance when a lot of players are on screen have received direct optimisations. We’re already seeing a good reduction in CPU usage by utilising some of the newer technologies made available to us after the game engine upgrade. Those individuals not limited by an older GPU will experience better framerate. We’ll be sure to dedicate more time towards game optimisations even after the update sees a full release. Game engine upgrades are quite the task! 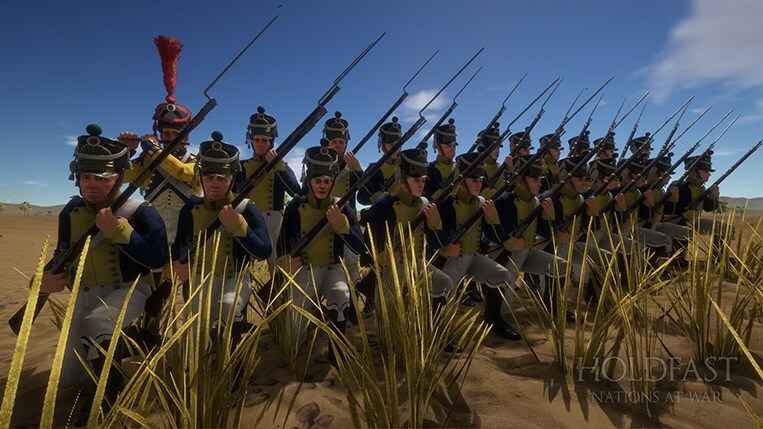 With almost every nook and cranny of the project Holdfast: Nations At War is built on requiring iterations to support newer technologies, one would expect to face a few bugs along the way. In this update, we’ve tackled most the issues reported by members of our fellow community participating in the BETA and several others that came through during our internal testing. Here’s a brief list of some of the bugs we solved from the previous BETA. - Fixed a bug with interaction labels not being correctly positioned. - Fixed a bug with interaction icons rendering over all objects in the map. - Fixed a bug with birds not animating correct and being assigned an incorrect texture. - Fixed a bug were the atmospheric fog on Tahir Desert was excessive. - Fixed an error which prevents players from loading some of the maps on Naval Battlefield. - Fixed several errors that were being produced when players interacted with various objects around the map. - Fixed an issue with reflection on the water present on land-based maps. - Fixed several issues related to destruction on ships. - Fixed an issue with some of the weather sounds being loud. - Fixed an issue with the weather not transitioning correctly when switching from one preset to another. 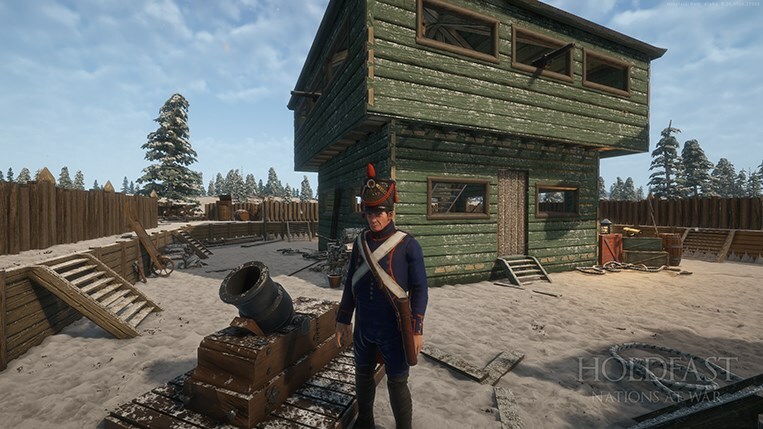 - Fixed an issue were Cannoneers weren’t present on the Highlands map. 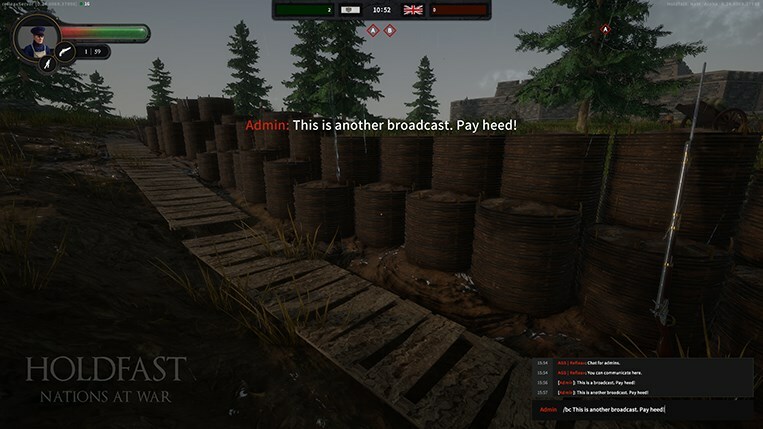 As a quality of life addition for all of those individuals hosting events, we’ve introduced an admin chat channel that is specifically reserved for discussion amongst those with administrative privileges on a particular server. You’re now also able to make use of some basic shortcut commands through this new admin chat. This functionality was all accessible through the ‘F1’ console but we thought that it would be especially convenient to have shorter versions of some of the most used commands accessible through this chat. Here are the shortcut commands we’ve introduced. - Administrators can broadcast a message by typing ‘/bc’ in the admin chat channel followed by their desired message. - Administrators can switch to a map by typing ‘/mr’ in the admin chat channel followed by a value according to the rotation set in the server configuration file. Would you like to have a go at what’s to come? Join us in the BETA! Hop in on our Community Discord to do so. You'll find all the details in the #announcements channel. It’s a great chance for you to provide us with feedback before the update sees a full release and help us make sure that everything is working as intended while you’re at it. You will be unable to see the BETA server in your server browser unless you download the game version present in the BETA branch. We had to undergo changes to the lobby system’s backend due to the engine upgrade. We would like to extend a special thanks to all of those good fellows who joined us in our testing. Your feedback is always greatly appreciated. Once again, thank you very much for your support and as always, may good health be yours.